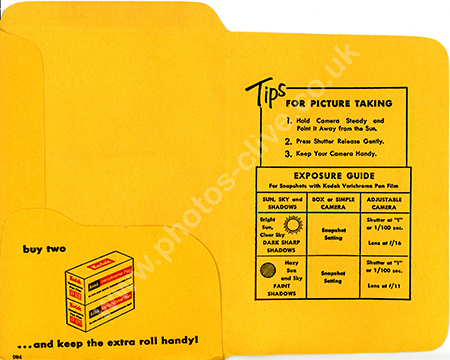 The inside of a photo packet has an exposure list telling you what speed and f-stop to use depending on how sunny it is and how defined the shadows are. Very much pre-auto exposure. For commercial use of this photo, including use on another website, please visit Alamy.com and search for M5JJC6. For a one-off print please see below. Negative Owner Clive Thompson LRPS owns the actual packet.